Blue Acres Blueberry Farm developed in the Fall of 2008. 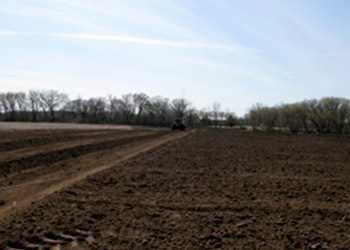 We tilled the field and amended the soil the following Spring to achieve the right acidity level for blueberries. 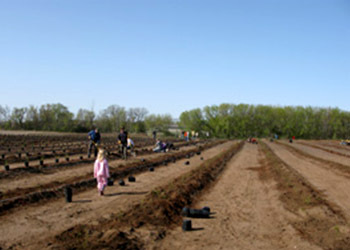 We gathered our family and friends to help us dig, plant and mulch 3 acres. Thanks to their efforts we can bring you the best blueberries around. Blueberries hang on the bushes a bit like grapes do. Due to the delicate nature of both the bush and berries, care must be taken when picking. 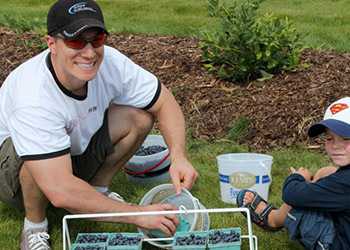 The easiest way to pick is hold your bucket under them in one hand and gently rub the cluster with your other hand simply rolling the berries between your thumb and fingers. The ripe berries will drop into your bucket while the unripe ones will remain attached to the bush. Pick all the blueberries on the top and front side of the bush first. Then separate the branches, opening the middle of the bush to get the hidden clusters. End by picking any that might be closer to the ground. Make sure all ripe berries are picked off the bush before moving to the next bush. 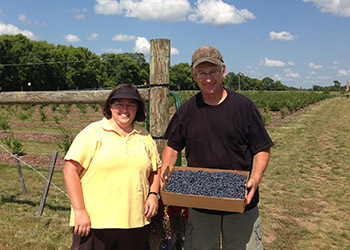 Practice kindness for the next picker, so they will have a new supply of freshly ripened berries in a couple of days. Blueberries are one of the easiest fruit to prepare and serve. There’s no peeling, pitting, coring or cutting. 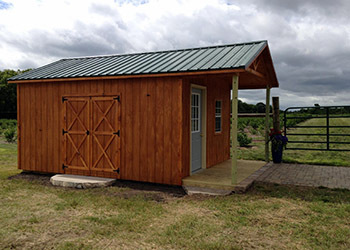 Unwashed blueberries keep in the refrigerator for up to 2 weeks. Blueberries can be easily frozen. Do not rinse at this time. The white film that resides on the skin’s surface is a protective bloom that helps preserve the berry. Gently roll dry berries on a towel to remove debris. Lay blueberries one layer deep on a cookie sheet lined with wax paper. A jelly roll pan works best so they don’t roll off the sides. Put in freezer for about 2 hours or until firm. Fill freezer bags or vacuum seal and freeze immediately. Studies make it clear that we can freeze blueberries without doing damage to their antioxidant capacity. Rinse with cool water right before serving. 1 cup of blueberries is 84 calories. 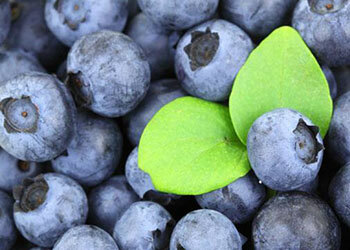 Blueberries contain no cholesterol or fat and are also low in calories. 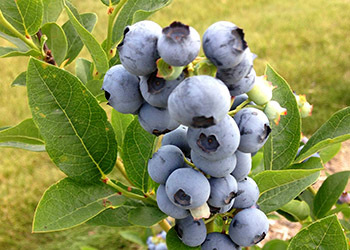 Blueberries are high in dietary fiber, Vitamin A and niacin. 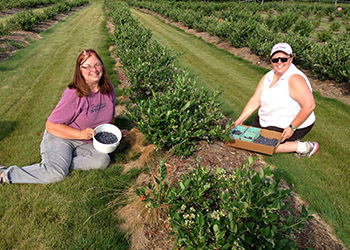 Blueberries have been grown at research stations in Minnesota for nearly a century. 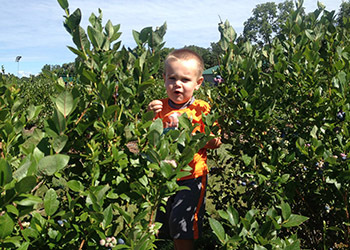 In 1967, a blueberry breeding program was initiated to develop cold-hardy, low-stature, high quality, large-fruited cultivars (from www.horticulture.umn.edu). We offer Northblue, Chippewa, Northland, Polaris, and the most recent bred cultivar, Superior. These plants feature aromatic and sweet flavor, firm texture and large fruit.